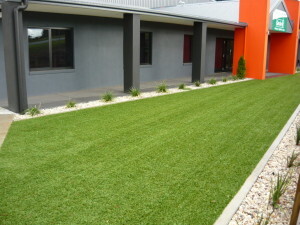 Gecko’s head office and showroom are located in Warragul, a town central the region of Gippsland, Victoria. Our qualified installers travel right throughout Victoria, Tasmania and Southern NSW. For other regions within Australia, supply only options are available and recommended installers have been established in some locations to support customers purchasing products through us. The company has been operating since August 2006 and has established itself as a market leader of Synthetic Grass, Rubber and Acrylic Surfacing. Much of our current work originates from repeat business and word of mouth referrals and our extensive portfolio of project case studies and customer recommendations is testament to our commitment to providing customer service excellence, premium products and services, professional installation and ongoing customer and product support. The diverse nature of our company divisions ensures that Gecko is able to offer it’s customers complementary services to ensure continuity of service and the latest in product technology and trends.